As a third year law student in the UNC Youth Justice Clinic, I was assigned to represent a six-year-old client who was charged with a minor property offense. It quickly became clear that my client, whom I will call Devon, a cognitively normal six-year-old, was unable to understand the juvenile delinquency process. As I attempted to prepare him for an adjudicatory hearing, I soon found that Devon could not distinguish among the roles of the prosecutor, court counselor, and his attorney. It was obvious that he would not be able to assist in his own defense. Through no fault of his own, he simply could not grasp the complicated system that is juvenile delinquency court. He was anxious and upset; he knew something was wrong, but could not make sense of the circumstances he was facing. North Carolina has the lowest age of juvenile jurisdiction in the country (and is one of only two states that automatically ends juvenile jurisdiction at age 16). Social science research demonstrates that pre-pubescent children lack the cognitive abilities possessed by adults to reason, exercise judgment, and control impulses. Without such abilities, young children often cannot participate meaningfully in their own defense and do not appreciate the wrongfulness of their actions. Even teenagers lag behind adults in their ability to predict and respond to the likely consequences of their actions. Given this reality, lawyers representing very young clients – clients like Devon, but even clients who are slightly older – must be prepared to challenge juvenile prosecutions from the outset. There are at least two approaches a juvenile defender may take: (1) file a motion to determine a client’s capacity to proceed, and (2) file a Motion to Dismiss (click to access) based on the common law infancy defense. In North Carolina, a person must meet certain capacity requirements to stand trial (see N.C. Gen. Stat. § 15A-1001(a)). In drafting a motion to determine capacity, attorneys should provide as many factual details about the attorney-client relationship as possible. Supplementing the motion with educational records, including grades and Individualized Educational Program (IEP) information, can be very helpful. While these motions can result in a judicial finding that the client lacks capacity and thus the prosecution cannot proceed, capacity evaluations can also be quite burdensome for a child and his family in that the child will have to meet with a certified forensic evaluator. Additionally, in some cases, a prosecutor may recommend confinement rather than dismissing the case. The second approach is limited to six-year-old clients, and avoids the potential negative impacts of capacity motions. A motion to dismiss based on the common law infancy defense argues that under the common law infancy defense, a child under the age of seven is presumed incapable of committing a criminal act, and that North Carolina has not abrogated the infancy defense in juvenile proceedings. In my case, the judge granted a motion to dismiss based on the common law infancy defense, which is attached. A commitment by lawyers to utilizing these advocacy approaches can help ensure that very young clients, like Devon, will no longer be fixtures in juvenile court. Veronika Sykorova is a third year law student at UNC School of Law and participates in the Youth Justice Clinic. Our next statewide call for juvenile defenders will be Tuesday, March 3rd at 1 PM. Call in number is 919-890-2204. Topics will include a case update, legislative update, an introduction to our new Assistant Juvenile Defender, Kim Howes, as well as any issues from the field. Looking forward to our discussion! 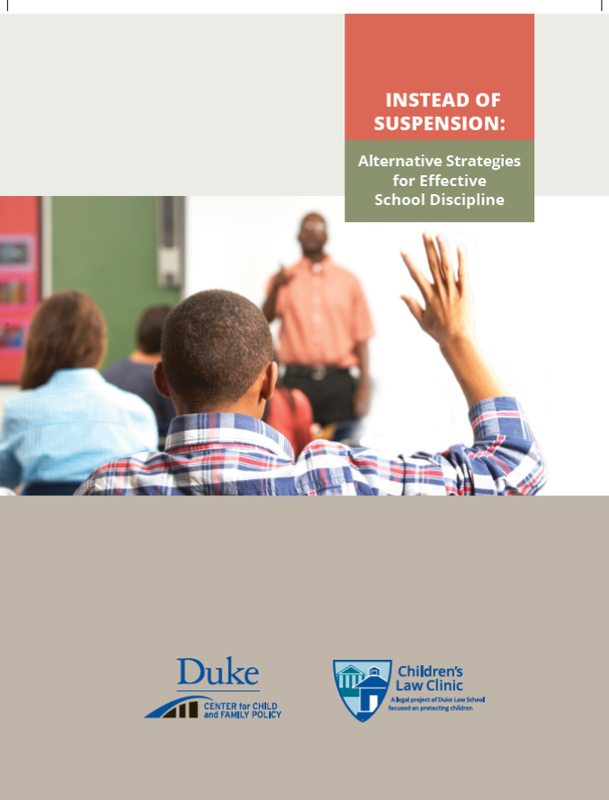 Instead of Suspension: Alternative Strategies for Effective School Discipline is a new guide produced by the Duke Center for Child and Family Policy and the Duke Children’s Law Clinic, co-authored by Jane Wettach, Jenni Owen and Katie Claire Hoffman. As described in the forward, “[t]his report includes a compendium of alternatives to suspension and brief profiles of examples of where those alternatives are in place.” Though written primarily for school personnel, this report should also be helpful to defenders to locate educational alternatives for their clients as a diversion, at pre-adjudication or at disposition. Here is a link to the report: Instead of Suspension: Alternative Strategies for Effective School Discipline. The Mecklenburg County Bar Juvenile Law Section is hosting its annual conference on April 17th. We have a great panel of presenters addressing Medicaid, trial skills, disproportionate minority representation, and restorative justice. A link to the program and registration can be found at http://www.meckbar.org/continueed/ce_programdetails.cfm?prog_id=960. Currently in North Carolina, defenders of justice, youth advocates, lobbyists, parents, and communities are working diligently to reform our justice systems, and to create positive outcomes for youth. I am proud to say that I have also joined the fight to reform policy, defend youth, and impact the lives of our future citizenry. My experiences as a sister with a brother entangled in the NC justice system; as a community organizer empowering families with deeply rooted ties in broken systems; and as a youth advocate providing a voice for those which have been silenced due to mental and physical oppression, has lead me to the path of legal defense for youth. I was personally forced to survive the ills of the criminal justice system. In early 2013, on my brothers’ 16th birthday, he was wrongfully arrested and charged with armed robbery with a dangerous weapon and conspiracy to commit armed robbery. Police officers identified him as the suspect through an illegal show-up, thereafter he was immediately taken into custody. As a 16 year old, he was charged as an adult and was treated as such. My mother was unable to see him for approximately a week and could not post bond due to financial hardship. With the help of state politicians and reputable juvenile justice advocates, the case was soon dismissed. Unfortunately, most youth in my brothers’ position as well as those who need effective assistance after committing a crime, usually do not have or know how to access the resources that were afforded to my sibling. During the summer of 2010, I interned with NC Child where I helped with the grassroots movement of that year’s Raise the Age Campaign. This proposed legislation attempted to raise the juvenile court jurisdictional age from 16 to 18 for particular crimes. In 2012, I interned with the NC Office of the Juvenile Defender, where I helped with the creation of the Office of the Juvenile Defender 2013 Strategic Plan Report and Summary. I drafted the summary of the juvenile defender survey and helped to facilitate panels in an effort to collect data from juvenile court judges across the state. In 2013, I worked for NC Senator Angela Bryant, where I became accustomed to the structure of state government and the creation and implementation of state law, including laws that directly affected the criminal justice system and the youth in the state for session year 2013-2014. Also in 2013, with the leadership and guidance of The National Juvenile Justice Network and NC Child, I created and implemented Parents & Friends of Incarcerated Youth Initiative (PFIYI). PFIYI is a community development program which operates in two counties in southeastern NC. PFIYI supports parents and community members with youth in the juvenile and adult criminal justice systems. All of my experiences have helped to empower and strengthen my intellect, ability, courage, and boldness to go into the trenches and fight to help save our youth. Through training, I have developed the ability to help youth in a multi-dimensional fashion to access community support, effective legal defense, and other helpful resources which will enable them to strive toward positive youth development. Currently, I practice law as a private defense attorney. My practice is mainly focused on youth advocacy and juvenile reform in southeastern NC. This includes criminal defense, education law reform and other youth related areas of law. My future goals include building a nonprofit youth law/advocacy center for the southeastern region. The law center will focus its attention on implementing a holistic case management system, creating a one stop shop for youth to connect with legal, social, educational, etc. services without falling through the cracks of the various institutions. Ultimately, the goal is to work with the already existing institutions to help build a system for youth that will promote positive youth development and rehabilitation for our younger population.